Your home and your family deserve to have the peace-of-mind that comes with owning a generator. In this turbulent economic times, however, you also need something that is affordable. While the Duromax XP4400E might not be the best model on the market, it does represent an excellent value. 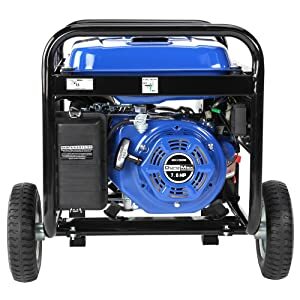 4 Gallon Tank – At a 50% load, this means your generator will run for a total of 8 hours on a full tank, which is usually long enough for the restoration of power by utility services. Electric Key Start – This makes it easier to start. Just turn the key and it will run, much like a car. The generator includes the battery in the package. Pull starter is available in the event the battery is dead. Automatic Low Oil Shut-off – Prevents damage to the unit in the event the oil runs low. Multiple Outlets – Two 120V, 3-amp, 3-prong outlets, one 120/240V, 30-amp twist-lock, and one 12V, 10-amp utility outlet. Allows for powering various types of appliances. Cost – Best portable generator available for under $500. 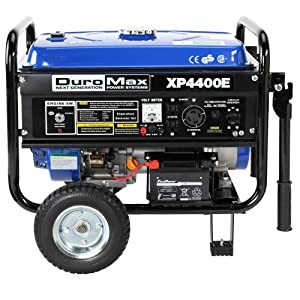 Most generators of this type would run you in the $600 range or more. As such, it acts as a terrific bargain. Reliable – I could power a refrigerator easily without trouble or any evidence of slowdown or difficulty. It goes without saying that having a reliable generator is essential in the event of power failure. Electric Start – Available on the XP4400E model, which is the only difference between it and the somewhat cheaper XP4400 model. Makes it easy, particularly as the pull start is at an awkward angle. Worth the added expense. Quiet – This benefit must be qualified as all generators are noisy. However, it does not run nearly as loud as some other generators on the market. This is because it uses a muffler designed for larger vehicles (such as cars) as opposed to a smaller muffler more commonly found on lawnmowers. Makes it a good choice for running the fans at night. EPA-Approved – Does not put out as much exhaust as other units. As a result, if you are concerned about the environment this unit is an excellent purchase. Non-CARB Compliant – Since I am based in Texas, this was not much of the problem for me. Unfortunately California residents will be unable to legally purchase and use this model. Load – While it advertises 3500 Watts continuous, I find it starts to struggle as it approaches the 3000 Watt mark. Recommend running at no more than 2500 Watts continuously. Can handle 3000 – 3300 in short bursts. Oil Drip Problem – While this is only a problem that seems to occur in transit, it still represents a problem to be fixed before starting the generator. Overall, the Duramax XP4400E represents one of the top portable generators available. While not THE best, it demonstrates a lot of the traits we look for in a high-quality generator. In spite of the issues with the load not quite meeting up to advertised specs, we find this is common in small generators such as these. As such, we do not hold this shortcoming against it. On the plus side, the demonstrated reliability of the generator and low cost makes it a fantastic value for any home-owner.